The Horror Digest: Jurassic Park: I HATE THIS HACKER CRAP! I saw this movie in the theater when it came out. I was probably... oh 7 years old and for some reason my parents thought it would be a nice family movie. Perhaps it is because of this movie that I can't watch scary movies in movie theaters. I need a nice calm place where I can cover my eyes for a little while without being judged. Although I should point out that my older sister took more "bathroom breaks" than I did so maybe I was pretty brave after all. It has been 16 years since this movie came out, and I still find the special effects to be the most realistic thing I've ever seen. Seriously those dinosaurs were the realest looking things ever. And it was terrifying. I still find it a bit scary because I can't help but put myself in the place of the characters. What would I do if a T-rex started tearing the car I was riding in apart? Granted, I wouldn't have been as stupid as that annoying girl and shine a huge flash light into the air so who knows if the T-rex would even have gotten the car in the first place but I probably would have thrown myself over the big wall rather than get eaten by a T-rex. The lesson of this movie is simple. Don't bring back extinct animals. And Definietly don't make a theme park out of it. OH and never hire Newman from Seinfeld to be in charge of passwords. There are so many amazing parts in this film- the beginning to start with, is really really scary. It kind of makes me nauseous thinking about what that would feel like to be dragged up a door by a raptor...yikes. Then there's the scene when our heroes first see the dinosaurs and the Jurassic Theme Park kicks in and its pretty majestic. But then when Santa tells them they have a T-rex you start to feel a bit nervous. The explanation of how they made the dinosaurs is great too, and of course the T-rex scene. But nothing. NOTHING compares to any of the Velociraptor scenes. And I mean all of them. When Ellie is trying to get the power back on and thinks Samuel L Jackson puts his hand on her shoulder WOW just wow. And when the Raptor hunter gets cornered, and the kitchen scene and then the end when they are surrounded on all sides and then they are SAVED by the T-Rex and it roars and the little banner falls down that said "When Dinosaurs Walked the Earth". I mean seriously that is some good stuff. Bottom line, this may not be a horror movie persay, but it is a pretty damn scary movie that is also funny, entertaining and extremely engrossing. 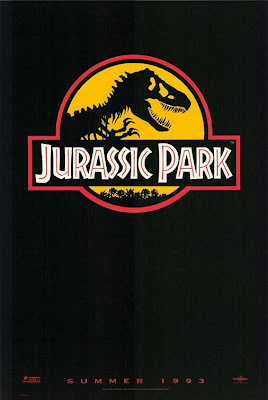 I am a little obsessed with dinosaurs and I probably owe it all to this film. God Bless you Steven Spielberg. Of course you find it scary! Have you read the original book the movie is based on? It is even more scarier than the movie itself, but of course the scenes are not that intense when they come from your imagination instead of the screene. Universal and the Merchandise give to this film that child film look a like.